8001 Rare Aaron Crane torsion pendulum year clock. There never were very many of these clocks made and they are very sought after today because of their unique style and movement quality. The case has the original black paint which does have some flakes but overall is in pretty good shape. There are freestanding columns with very detailed cast brass capitals. The distinctive glass dial has the original paper backing and it is in great condition. Often these dials are chipped or broken. There is a very good label plus the original hands. I believe the six ball brass pendulum is an old replacement. This clock has a massive double fusee movement with a torsion style escapement and pendulum. It is missing the suspension spring with the hangar and fork. There is a replacement spring on it now just so it looks as it should for the photo. One more unusual feature of this clock is that it will run one full year on one winding. That is quite an accomplishment when you consider it needs to run a strike train also. 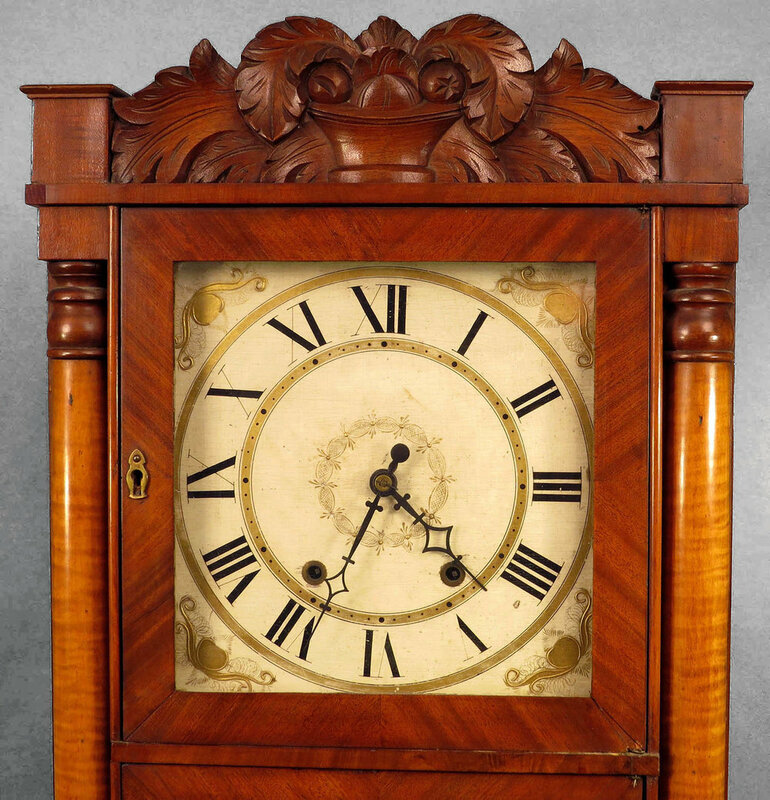 This clock has that distinctive Torrington or “east-west” wood movement. It has a mahogany case which has been very nicely refinished and with nearly perfect veneer. This is a very pleasing case style which is smaller in dimensions than the typical Terry style. The base and feet plus the scroll top are original which is seldom the case these days. The brass finials are old replacements. The dial is in excellent shape. Often these rather thin dials have warped resulting in some paint loss. This dial is the exception. The reverse painted lower glass is a rather poor quality replacement and the upper glass has also been replaced. This clock retains the original hands, pendulum, key and weights. The label is in very good condition. The 30 hour wood works movement looks like it was well cared for and it is quite clean. I did not see any chipped teeth on either gear train. The strike great wheel has been repaired but it looks functional. Both trains operate properly with a bit of finger pressure. 8003 Birge & Fuller 8 day wagonspring clock. Here is a clock that is in excellent, original condition. The refinished mahogany case is very clean. It has only one small veneer chip at the lower right of the upper clock case portion. All three glasses are original with the lower two being cut, not simply frosted and they are perfect without one chip or hairline. The painted zinc dial has a raised chapter ring and good, original paint. The blue/green label is a little dark but is still quite legible. The hands are the originals along with the pendulum and key. This is an eight-day clock with hourly strike on a gong. The movement is signed “Birge & Fuller, Bristol, Conn, USA”. The chains are complete and the clock is running. 8004 Seth Thomas 8 day wood works clock. This clock has a nicely refinished solid mahogany case which is in great condition. There is only one tiny veneer chip on the upper left corner. The columns are tiger maple and they make for a good visual contrast with the darker mahogany. The carved paw feet and fruit basket crest are perfect without any chips. The lower glass has a very well done signed replacement reverse painting. The upper glass is original. The two brass escutcheons are old replacements. It has the original hands, compound pulleys and pendulum while the weights are replacements. The dial is in very good condition without any paint lifting. 8006 Rare Salem Bridge carved column clock by Spencer, Hotchkiss & Co. of Salem Bridge, Conn. Created by Heman Clark and dating to about 1830, these 8 day weight driven brass movement clocks were at the top end of the clocks being produced at that time, especially when compared to the wood movement clocks still being made. These clocks were at the forefront of the brass movement shelf clock era. The mahogany case has been nicely refinished and is just about perfect. The veneer has no faults at all, the carvings are very crisp and well detailed and there are no chips in either the carved paw feet or pineapple finials. The double cornucopia at the top depicts prosperity and the original owner must certainly have been prosperous to have been able to afford this clock. They were very valuable at the time and are still so today. It appears to be the original glass above and an old replacement mirror below. The clock comes with the original weights, compounded pulleys, pendulum, key and hands. The tip of the seconds hand is missing. The label has darkened and has some losses but it is still legible. This is an 8 day clock with rack and snail strike on the hours on a resonant iron bell. I see nothing amiss with the movement and it is running. For a history of this firm, see page 46 of the #13 Bulletin on Salem Bridge clocks by Chris Bailey. I will include a copy of that publication with the clock. 8007 Welch, Spring & Co. Khedive mantle clock. There were about a dozen clock models made that used the Patti style movement and they were all named after world famous people of the time. Some were opera stars but this one was named after the Turkish Khedive or Viceroy of Egypt who was the ruler at the time the Suez Canal was opened in 1869. Egyptian Revival became a style of the time and thus the naming of this clock. The case is polished mahogany with the original finish and it is in fine condition. This case is almost perfect and it has obviously been well cared for. It has a two part dial with a gilt centerpiece and porcelain numeral ring plus an open jeweled escapement. There is one hairline in the porcelain between the numeral V and VI. It has two heavy beveled glasses. One for the dial and one for the pendulum view. That lower glass also has the original gold leaf border decoration. The distinctive pendulum is solid brass and the delicate trefoil hands are the originals. Only a portion of the label remains on the rear cover. This is an eight day clock with hour and half hour strike on a cathedral gong. It is currently running and striking properly. 8009 Erastus Hodges, Torrington, Connecticut transition style wood works shelf clock. An honest, original clock in unrestored condition. If you want to put in a bit of effort to clean the case and put on a set of feet you will have a fine and rather rare clock at a very reasonable price. The stenciling on the splat should clean up nicely but the stenciling on the columns is worn. There is also a veneer chip at the bottom left and a missing cap at the upper right. The colorful dial is in good condition without any of the usual warping but it would also benefit from a bit of cleaning. The best part of the clock is the original reverse painted tablet. For some reason, Torrington clocks seldom retain their original tablets but this one is the exception. It does have some paint losses at the center but send it to Tom Moberg and those losses will disappear. You will not be disappointed with his work. I have used his services for over 30 years. This clock comes with the original hands, weights, pendulum and key. It also has the original upper glass and a slightly stained but very legible label. This is a 30 hour wood works clock with hourly strike on a bell. The movement is very dirty but I looked it over carefully and did not see one chipped or replaced tooth. With some finger pressure on the gear trains both the escapement and strike mechanism operated properly but a cleaning and new cords will be needed to put the clock in running order. 8011 J. C. Brown, Forestville Manufacturing Co. This clock has a mahogany case which has been refinished. It is very clean and there are no case problems whatsoever. There are no chips or cracks to the ripple molding and the joint at the peak is perfect without any loss or separations as is usually the case. The upper glass and the frosted tablet are both replacements. I do have the original lower glass but it is clear indicating that it must have been a reverse painting originally. I am including that glass with the clock in case you wish to have another painting done. The signed dial is original but you can see that it was poorly repainted around the outer edge. Personally, I would send it out to a dial shop and have them do a better color match before I would consider a total repaint. The green label is complete and is very legible. The pendulum is original while the hands and key are replacements. This is an eight day clock with hourly strike on a coil gong. The movement is signed “J. C. Brown, Forestville, Ct. U.S.A.” It does tick and strike but it has not been serviced in a long time and that will need to be done to put the clock in good running order. 8024 Early and rather rare Henry Sperry cottage clock. I have always loved these cases which were grain painted to resemble rosewood. Often that paint has worn off over the years but this example is in remarkably good condition. I believe the finish is original and I do not see any case damages or problems at all. One feature that makes this clock interesting is that it has one piece of glass for the entire front, the bottom third of which has a reverse painted area with a pendulum view. That reverse painting is also perfect without one spot of lifting paint. The painted dial is also very nice and is signed “HENRY SPERRY & Co. NEW YORK”. The label is somewhat stained but it is complete and very legible. The hands, key and embossed pendulum are the originals. This is a one day timepiece – meaning it does not strike – and it is running. Note that this is one of those upside down movements where the pendulum is suspended from the top of the case and the verge is upside down. 8012 Atkins “London” mantle clock. This clock has a rosewood case in the original finish and it is in excellent condition with the veneer being virtually perfect. With just a bit of case cleaning, the color and grain of the wood would be even more visible. Both reverse decorated glasses are original with just a small amount of loss in the black background color. The dial is original and in good shape but for one paint flake above the center arbor. 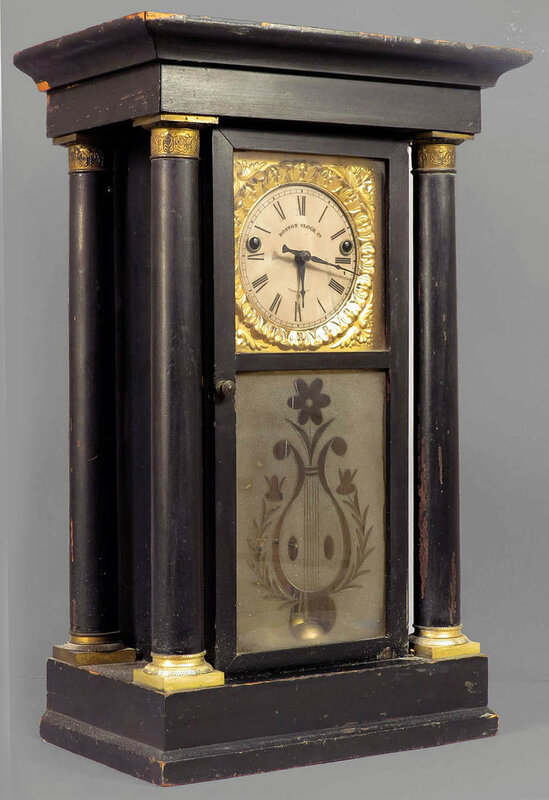 There is an excellent label showing that this clock was retailed by Daniel Pratt’s Sons in Reading, Mass. It has the original hands and distinctive copper colored pendulum used by Welch and Atkins. This is an eight day clock with hourly strike on a coil gong and it is in good running order. 8013 Chauncey Jerome, New Haven Connecticut. Yes, this is simply an ogee clock but it is worth a look because it is so complete and original. The mahogany case is virtually perfect and was nicely refinished some years ago. The stenciled floral glass is probably by Fenn and it is also perfect without any wear or problems. The painted zinc dial has a raised chapter ring, colorful corners and is in great shape. The label has darkened and has some losses but is still quite legible. The minute hand is a replacement while the weights, pendulum and key are the originals. This is a 30 hour clock with hourly strike on a gong. The previous owner said that it had been running well for him for a number of years. 8080 Another E. N. Welch Arditi double dial calendar clock. E. N. Welch Arditi double dial calendar clock. This clock is in near perfect, original condition. It will be hard to find one better. The solid walnut case has no chips, damages or loose moldings and it has a good original finish. It obviously was not used very much and it has that “fresh out of the attic” look. Both dial papers are original and they show very little wear. There are three labels and all of them are in very good shape. It also has the original hands, pendulum, glass and key. This is the model that uses the Gale Patent Calendar and that lower movement is signed and dated April 21, 1885. Note that the calendar dial is not set up in the usual manner with roller papers but with subsidiary dials instead. Truthfully, as I write this I have owned this clock only a few hours as I purchased it today. It is running and striking properly but I have not had time to check out the operating condition of the calendar.